Metabolomics Ion-based Data Extraction Algorithm (MET-IDEA) is a computer program for processing large-scale metabolomics data. MET-IDEA utilizes network Common Data Form (netCDF) data files available from a diversity of chromatographically coupled mass spectrometry (MS) systems, utilizes the sensitivity and selectivity associated with selected ion quantification, and greatly reduces the time and effort necessary to obtain large-scale organized data. This article reports on recent improvements to MET-IDEA which include new visualization of peak integrations, display of mass spectra associated with integrated peaks, and optional manual peak integration. The computational performance of MET-IDEA has also been improved to avoid memory overflow during the processing of large data sets and the software made compatible with 64 bit CPUs and operating systems. These new functions improve the performance of MET-IDEA, and they allow users to visualize peak integrations and curate the results through manual integration if desired. 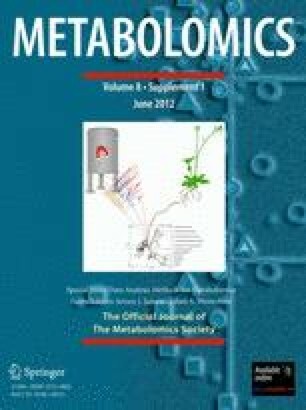 The improved version of MET-IDEA better facilitates the quantitative analysis of complex MS-based metabolomics data. MET-IDEA is freely available for academic and non commercial use at (http://bioinfo.noble.org/gateway/index.php?option=com_wrapper&Itemid=57). Commercial use is available via licensing agreement. Z. Lei and H. Li contributed equally to the work. Baran, R., Kochi, H., Saito, N., Suematsu, M., Soga, T., Nishioka, T., et al. (2006). MathDAMP: A package for differential analysis of metabolite profiles. BMC Bioinformatics, 7(530), doi: 10.1186/1471-2105-7-530. Florida_DEP. (2011). CM-018-1.7 Laboratory policy regarding manual chromatographic peak integration. pp. 1–5. http://www.dep.state.fl.us/labs/cgi-bin/sop/sop1.asp?sect=CHEMISTRY.